Please would you be so kind to assist me with a design dilemma? 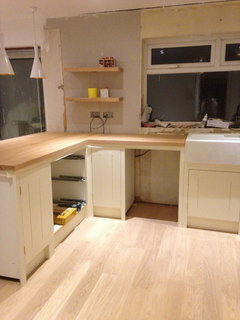 We have just had a new kitchen installed. It is going to be painted a dark blue on the units (little Greene hicks blue) and we have white metro tiles to go up. Do you think the shelves look ok? 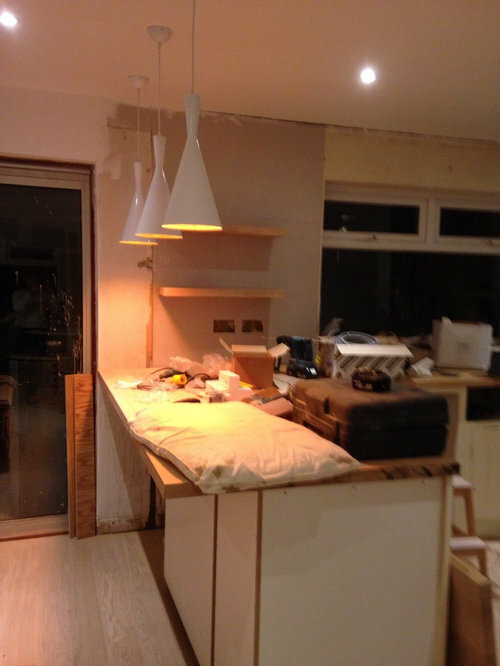 I am worried about the shelves over the breakfast bar not being long enough. I think they look a bit odd! I have had to make so many decisions and not sure I have got any right! 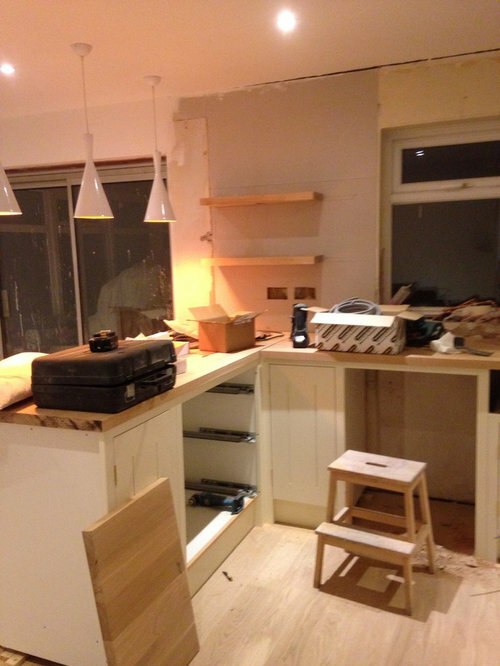 First pic the extractor will be between the shelves above a range cooker. I was worried they were too close to the pendant light so decided they should not go too near....then I thought they should be in the centre....argh expensive mistake! I think the shelves are fine near the range but think they are unnecessary near the breakfast bar. I would rather see wall art. I agree, a big canvas there would look great but I am a messy cook. I can imagine a blender or mixer related disaster happening. I wanted a tea station with cups hanging from hooks and kettle underneath on worktop and nice tea canisters and teapots on shelves. Maybe longer shelves but not centred, so towards the window more? Also do you think dark blue on units will work? I would make the shelves over the breakfast bar the full width of the wall. 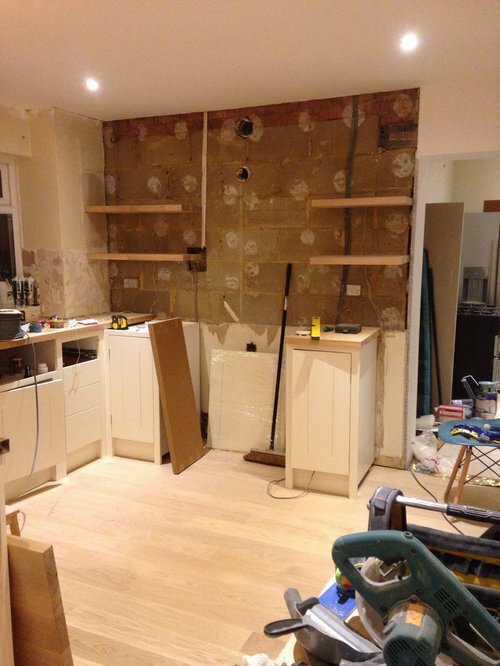 The shelves each side of where the extractor and cooker are going may be a dirt collector consider having closed wall units, maybe with clear glass doors. We have moved them over a bit using the same fixings in the wall just making new holes in the shelf. I think it looks better what do you think? Still think they would look better all the way across the wall. If the main purpose of them is to have more storage to get thing off the worktops why not have longer shelves giving you more space. I think your ideas are really coming together, it's looks great. I'd suggest that you won't lose much light if you had longer shelves but I see what you mean re interfering with the lights. It may well be possible to bring the outside ones inward slightly to help keep them away from the shelves if you swapped them out for longer ones. I'd say they would look better if they were bigger personally, but at the end of the day it's your space so do what you're comfortable with. We like them, the finish matches the kitchen tops and from the photos it looks like the size and location are ok... nothing to dislike. You could make them longer, but you may not know until you start using them. 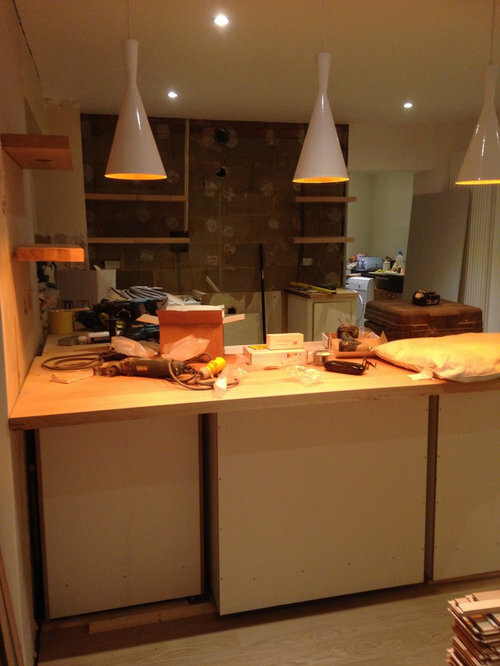 If the lighting is an issue which it may not be you could try and fitting led lighting strips underneath. The shelves look much better in the centre. Where is your kitchen from? Will you be painting by hand? I'm just curious as I wish to do something similar. Help with new kitchen design - I can't get it to work!!!!! !